Ontario Premier Doug Ford has confirmed his government's commitment of $1.2 billion for Ottawa's light rail expansion. 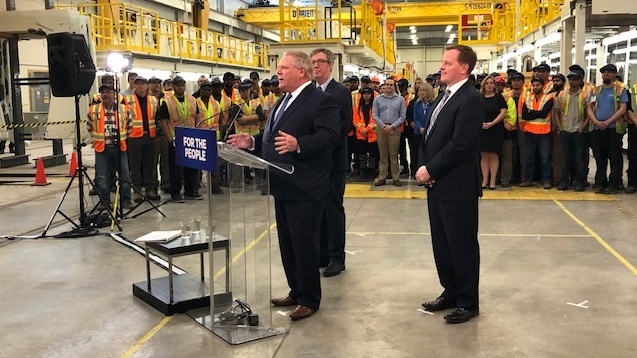 Ford made the announcement at an east-end train yard on Belfast Friday. "Our government is providing more than 1.2 billion to build stage 2," said Ford. "Building a quality transit system is a big step forward in making sure Ottawa is open for business and open for jobs." The promise was originally made by the former Liberal government. CTV asked if Ford ever had a doubt on whether he would keep honour the pledge. "Never a doubt," said Ford. "The people of this great city deserve a world-class transportation system that gets both of them and the economy moving." The provincial money was needed before any construction contracts could be signed. "He kept his word, I think he's tired of hearing from me' said Mayor Jim Watson. "This was the last piece of the puzzle, we needed to get this." The price tag for Stage 2 ballooned more than $1 billion to $4.66 billion earlier this month. Despite some resistance from city councillors, the proposal was ultimately approved. The project which will see LRT taken west to Moodie, east to Trim Rd., and extend the O-Train Trillium Line to Riverside South is also delayed by two years to 2025. The federal government is matching the province with $1.2 billion of their own, the rest of the balance will be the responsibility of the city. Stage 2 of LRT is expected to add 44 kilometres of track and 24 new stations bringing more than 70 per cent of residents within 5 kilometres of rail. Transit Commission Chair Allan Hubley says it's a big step not only for Stage 2, but eventually for Stage 3 to Kanata and Barrhaven. "The work can get started, the trains can start to roll," said Hubley. "There's no pulling it back, I've seen the signature, it's there." Premier Doug Ford announcesd $1.2 billion for Ottawa's Stage 2 of LRT.